Welcome to the official start of my “Best of British” series and the review of one of my most favourite discoveries since I started doing research for this feature. I first heard about La Belle Lune through Content Beauty & Wellbeing and ever since I received this gorgeous little bottle of magic, it has been the new star of my skincare universe. This is one of the most beautiful products I have ever used and I am quite addicted to what it has done for my skin. I am so lucky that I get to try a lot of products, but Organic Skin is something special and boy, did I fall for this beauty hard. I cannot wait to tell you all about it, oh and try not to get too distracted by the beautiful packaging because the product inside is even better – trust me. Now, what immediately piqued my attention about this oil (other than the amazing gothic design) was the ingredients list. I have quite a few oils that I already use and enjoy but none quite like this one. I loved the inclusion of ingredients like Milk Thistle Oil (healing and cell renewal), Chia Seed Oil (high level antioxidant) and Frankincense Essential Oil (powerful anti-inflammatory), which are not in any of the oils I currently have in rotation. As well as those, there are oils I already know and love like Rosehip Seed Oil, Sea Buckthorn Oil and Carrot Seed Essential Oil. I thought this seemed like such a unique and interesting mix of oils that would do wonders for the skin and I was not wrong. Organic Skin is a nutrient rich elixir made of 100% organic oils packed full of vitamins A, B1, B2, B6, C, D and E, Omega 3, 6, 7 and 9, Beta Carotene and Amino Acids that work together to nourish, heal and protect the skin in so many ways. It is cell regenerative, anti-inflammatory, tissue repairing, moisture balancing and will help address acne, scarring, fine lines, wrinkles, sun damage, tone and texture. It protects the skin against pollutants and fights free radicals as well as improving elasticity and firmness. It is a powerhouse of a product and I adore it. One of the things I respect and love most about this brand is the story behind its creation. La Belle Lune was started by the lovely Annabelle in a small town outside of London (Norwich), in order to share her skin healing potion with the world. 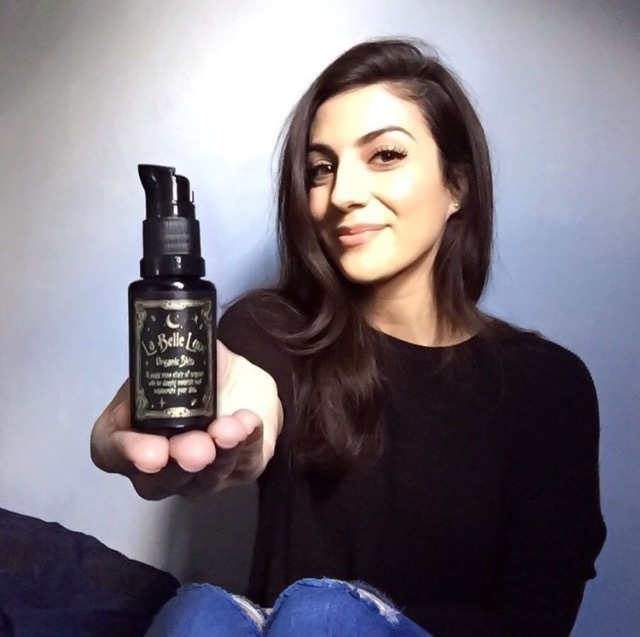 Annabelle had struggled with acne through her teens and in to her adult life but with these oils, she managed to keep her skin free from deep scars/marks – even when her acne was at it’s worst. Because of her experience and success she wanted others to benefit from the healing powers of Mother Nature and thus, Organic Skin was born. As someone who dealt with a sudden bout of persistent acne a few years ago, I appreciate this so much. This is exactly the type of product I had no idea my skin needed back then and I’m so glad it’s out there now so hopefully others won’t have to struggle like I did. These oils can heal the skin so much better than harsh over the counter products and you can check out their website for a full breakdown of each ingredient to learn how (here) and I highly recommend the post about why they use the violet glass bottles (here) – I found it really interesting. As you can see from the photo, it has a soft golden colour and is a medium consistency that is nourishing but lightweight and feels beautiful on the skin. The scent is so intoxicating yet not at all overpowering and I can’t help but feel more relaxed and soothed when I use it. I enjoy the ritual of applying it so much more because of the calming aroma. It comes in a violet glass bottle with a pump and one press is enough for your entire face, although I do use a little more when my skin is dry and a little less when I use it during the day. I love to layer this with my Bravura 2% Salicylic Acid Peel because it stops any dryness and I have an idea that it would be perfect with the Kypris Clearing Serum as a blemish busting emulsion. Update: Not only that, it has worked amazing well with any of my retin products like NAAP and The Ordinary‘s Advanced Retinoid 2%. I have just been loving how my skin looks since I started using this. With all the travel, late nights, long days, inflammatory foods, alcohol consumption and bad weather, my skin should not look as good as it does. It is plump, calm and glowy and the texture is beautifully soft and smooth. Most importantly, I know it is the main reason my skin has been blemish free and that is something I am so thankful for because really, with everything I have been doing and eating, I should have at least one spot (or five). 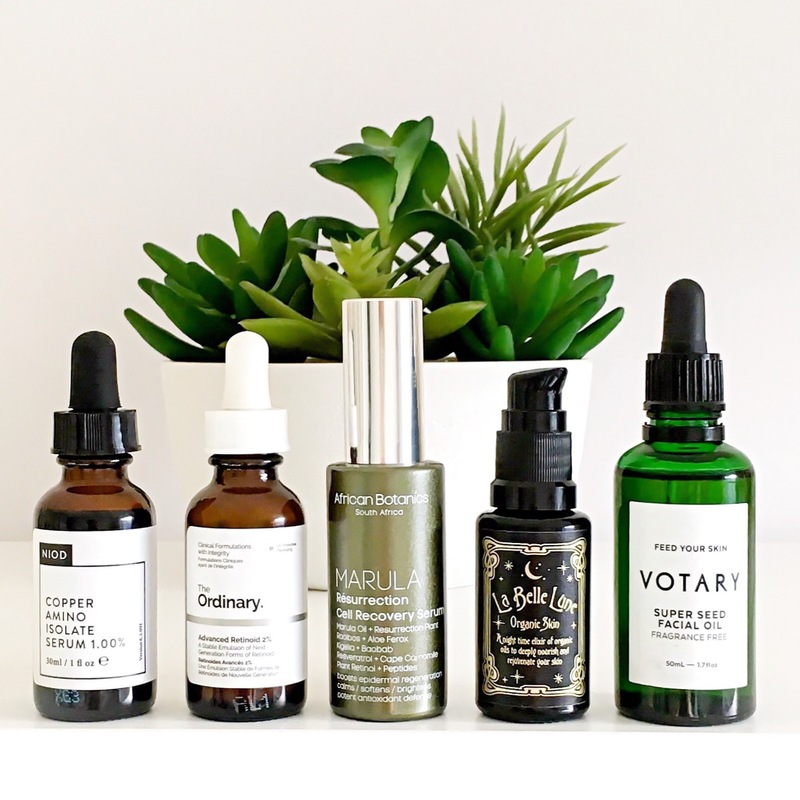 I am using quite a few products right now that have been working so well for me (more on those soon) but Organic Skin is definitely a hero out of the bunch and I can’t recommend it enough. Because of this, I have teamed up with the very kind and generous Annabelle to give away two bottles of Organic Skin, so head over to my Instagram now to find out exactly how to enter! Good luck! Organic Skin 20ml is £46 and available directly from La Belle Lune here or for free worldwide delivery, you can order it from their exclusive retailer, Content Beauty & Wellbeing here. I havent used Franckincense either 😊😊it must smell gorgeous! I love your reviews and many products sound amazing. It’s a little hard to find out where to start for me. I am 23, combination skin, many blackheads and a bit of scarring. What are the most important things to do? I am considering oskias cleanser, bravuras tonic and peel, but have a hard time deciding on an affordable moisturizer or oil. Can you recommend something specific? Or an overall starters routine exploring article would be very nice too. Why do you prefer oils over moisturizers? Thank you for your blog, it makes me realize I can do so much more to help my skin than just cleanse and put cream on my face. i’m looking for a powerful serum to replace my sunday riley luna oil since its not safe to use during pregnancy. my skin is combination type, my concern is antioxidant, brightening and light weight serum. could you recommend any day and night serum for me? i’m curious about this la belle lune too..